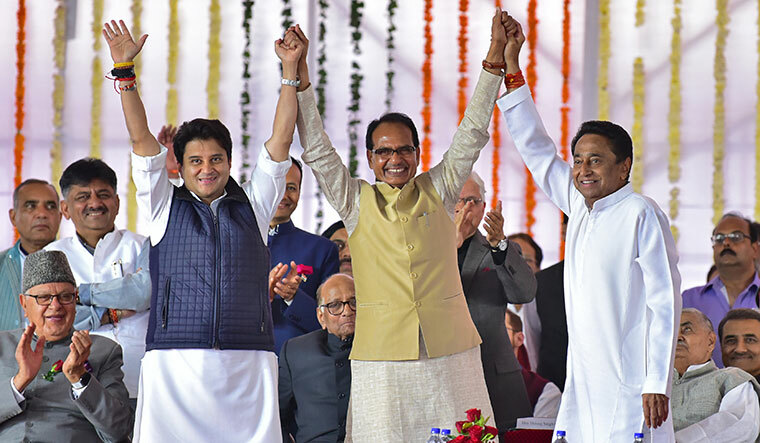 AT THE DECEMBER 17 ceremony in which Kamal Nath was sworn in as chief minister of Madhya Pradesh, one of the star attractions was outgoing chief minister Shivraj Singh Chouhan. Congress leaders treated Chouhan with elaborate courtesy. The second order Nath signed as chief minister was to allot Chouhan a bungalow set in five acres in the posh Professors Colony in Bhopal. The bungalow, located barely half a kilometre from the chief minister's official residence, was once occupied by External Affairs Minister Sushma Swaraj. Both Nath and senior Congress leader Jyodiraditya Scindia later called on Chouhan at his home. A former minister close to Chouhan said the Madhya Pradesh loss was the result of the campaign being controlled by outsiders like Amit Shah. Although Chouhan is loved by party workers, the high command is not leaving any opportunity to portray him as the villain of the assembly election defeat. “Chouhan has achieved his position as a leader who is moderate and acceptable to all,” said political analyst Pravin Dubey. “Compared with Prime Minister Narendra Modi, everybody wants to cultivate relations with him. Chouhan is amiable and gels well even with his rivals.” Dubey said the Congress showed him extraordinary respect to acknowledge the fact that although he lost the elections, Chouhan had fought valiantly. Congress president Rahul Gandhi called him a gentleman. While his rivals continue to heap praise on Chouhan, the BJP has been reluctant to acknowledge the contributions of the leader who ruled the state for 13 years and brought the saffron party to power in 2008 and 2013. After he lost the assembly polls, Chouhan announced his intention to stay on in Madhya Pradesh and take over as opposition leader. He also wanted to undertake a yatra to thank voters for not rejecting him “completely”. The BJP high command, however, turned down both requests. Chouhan was denied permission to take out the yatra and was not even allowed to nominate an opposition leader of his choice. A BJP insider said Chouhan wanted to accept defeat in the assembly elections gracefully and allow the Congress to work for at least a year as he felt the new government would fail because of its internal contradictions. He had made it clear that he would not try to form a government by cobbling together support from others. A section of BJP leaders close to party president Amit Shah, however, wanted the BJP to form the government. State BJP president Rakesh Singh said on the counting day that the BJP had the numbers and would stake claim to form the government, even after Chouhan had conceded defeat. Later, former minister Narottam Mishra and party general secretary Kailash Vijayvargiya said the BJP had more MLAs and would defeat the Congress in the speaker election. But, the Congress nominee won with 121 votes in the 230-member assembly. While many of his erstwhile cabinet colleagues are yet to adjust to opposition politics, Chouhan has settled well into the new role. Denied permission for his thanksgiving yatra, he has been making private tours to various districts. He went to Rajgarh when the cold wave hit crops in the region. He visited Mandsaur after a BJP leader was murdered. He toured the Vindhya region, where the BJP performed exceptionally well. Chouhan is away from Bhopal at least four days a week. Political analyst Manoj Sharma said Chouhan knew well how to stay in the limelight. “He has an excellent understanding of political issues. His down-to-earth behaviour and hard work are liked by many. Not a single day passes when Chouhan is not in the field addressing people or meeting workers in remote areas,” said Sharma. Although Chouhan is loved by party workers, the high command is not leaving any opportunity to portray him as the villain of the assembly election defeat. In the Lok Sabha election committee for Madhya Pradesh, Chouhan was relegated to number 13, low down in the hierarchy. Congress spokesperson Syed Zaffar said it was how the BJP treated its senior leaders. “One must not forget what Modi did to L.K. Advani,” he said. A section of the BJP and the RSS believes that the party lost in Madhya Pradesh because the BJP had become too personality centric in the 13 years under Chouhan. Chouhan's supporters, however, believe that he helped convert the BJP's image from that of a Brahmin-Bania party to a party of “the poor and the peasants”. The high command clearly does not see it that way. Instead of giving him a prominent organisational role, Chouhan has been made the BJP's national vice president, a post shared by several junior leaders. 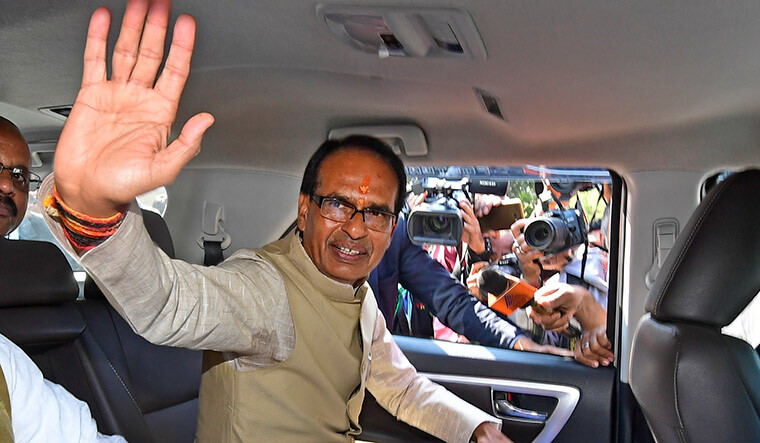 A former minister close to Chouhan said the Madhya Pradesh loss was the result of the campaign being controlled by outsiders like Amit Shah. “Had Modi and Shah kept away, we would have won easily,” he said. “We had to face the baggage of the Union government. Chouhan was a popular chief minister whom the people wanted to give another chance, but the policies of the Central government were too damaging.” There are conspiracy theorists who even say that Modi and Shah did not want Chouhan to have a fourth term. They say that a fourth term would have made him the tallest leader in the party, posing a direct threat to Modi. Even after the defeat, Chouhan continues to be one of the tallest leaders of the BJP. Said BJP spokesperson Milan Bhargav, “Chouhan is the biggest farmer leader not just in the BJP, but also in the country. What he has done for the farmers is exemplary.’’ The former chief minister is not leaving any stone unturned to make the BJP realise that it is difficult to ignore him. He gives statements on a daily basis, which are lapped up by television channels. During a recent television interview, he placed Advani's portrait in a such a way that it was visible in all frames. He has been further emboldened after the CBI gave him a clean chit in the Vyapam case.